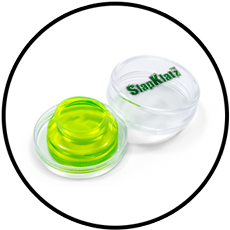 The original 4 piece SlapKlatz package, containing 2 medium sized and 2 larger gels - all together in a small and pocket friendly container. With SlapKlatz you can not only dampen your batter heads, you can also dampen and control your bottom heads. Or cymbals! SlapKlatz has been know for it's awesome stickyness, as well as it's ability to clean with just soap and water.